More than 150 plungers made such a splash Saturday, March 25, at the first annual New Bedford Polar Plunge at East Beach they launched what is hoped to be an annual tradition. The New Bedford Police Union, in partnership with the Massachusetts Law Enforcement Torch Run, hosted the plunge. 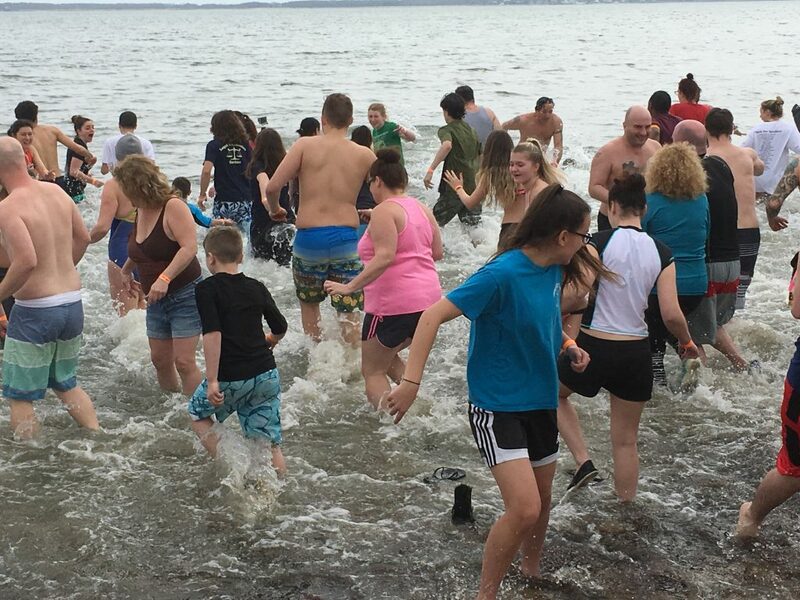 The plungers braved 38-degree water temperatures and 46-degree weather to run into Buzzards Bay, raising funds and awareness for Special Olympics MA (SOMA) athletes, teams, families and volunteers. The event took place at East Beach and the Community Center on South Rodney French Blvd. New Bedford Police Union Members, Sgt. Josh Fernandes, Officer Al Harrell and Josh’s wife, Erika Fernandes, joined long-time Special Olympics coaches Alyssa Lynch and Darren and Sarah Fluerent in planning this first-time event. “We are proud to support Special Olympics through this event,” said Josh Fernandes, who is also a member of the Police Union’s Executive Board. The New Bedford Police Union was the day’s top law enforcement fundraising team. The team’s enthusiastic members raised $1,909. Donations are still being made but initial tallies show funds raised to be $21,194 and counting. Donations are still being accepted at: www.newbedfordplunge.kintera.org or sent to: Special Olympics MA ATTN: New Bedford Plunge, 512 Forest St., Marlborough, MA 01752. A post-event celebration included Top Fundraising awards, raffle prizes and food for all thanks to Domino’s Team New Bedford, Subway, D&D Catering and the New Bedford Vocational Technical High School culinary department. Music was provided by Lightworks Productions and event Master of Ceremonies, WBSM host Phil Paleologos. Top Fundraising K-12 School: Potter’s Plungers (Dartmouth’s Potter School): $1,126 led by team captain, student Emma Carrier. Polar plunge sponsors were: Attorney John Seed; Enos Home Medical; Sault Fitness; Dominos; Lightworks Productions; Hawthorn Medical Associates; Boulevard Funeral Home; Mr. Cesspool; City Council Steven Martins; Busters Sports Bar and Grill; Knuckle Heads. Special Olympics Massachusetts is able to provide year-round sports training and athletic competition in a variety of Olympic-style sports to over 12,000 adults and children with intellectual disabilities across the state because of community partners like the Law Enforcement Torch Run (LETR). LETR is an international charity made up of law enforcement officers that raises funds and increases awareness for Special Olympics. We are fortunate to have amazing partners with the New Bedford Police Union and other community leaders who are helping plan this event. Polar Plunge is one of LETR’s signature fundraising events. A Polar Plunge is a winter fundraising challenge whereby individuals or teams “plunge” into a cold body of water in order to raise money for Special Olympics. Each participant collects donations from family, friends and businesses in hopes of raising lots of money for their local Special Olympics communities. In 2016, more than 1,000 individuals took the plunge in Pittsfield, Sharon, Marlborough, Hull, Revere and other towns, raising over $350,000 for Special Olympics Massachusetts. The planning team of volunteers has plunged in the past at a different Special Olympics MA Polar Plunge. Seeing interest and potential in a New Bedford Plunge – the committee decided to plan their own in 2017. Raising nearly $10,000 for their team alone in 2016, the group is more dedicated than ever. Special Olympics Massachusetts provides year-round sports training, athletic competition and other related programming for nearly 12,000 athletes with intellectual disabilities across the state in over 245 sporting competitions each year. Through the power of sport, the Special Olympics movement transforms the lives of people with intellectual disabilities. http://www.specialolympicsma.org.